Abstract: A reversed-phase HPLC method was developed to separate a mixture of eight pharmaceutical drug substances which included Lidocaine, Meclizine, Ciprofloxacin HCl, Ropivacain HCl, Adifovire dipivoxil, Doxipin HCl, Thiocolchicoside and Trazodone HCl. These drugs are used as antibiotics and relievers and some used to treat constant and recurrent migraines. Agilent 1100 series HPLC system with Diode Array Detector was used with Water C18 (250 x 4.6mm, 5 μm) column and a mobile phase consist of solvent A (25mM Potassium Phosphate Monobasic buffer at pH 2.5) and solvent B (20% methanol and 80%Acetonitrile mix). 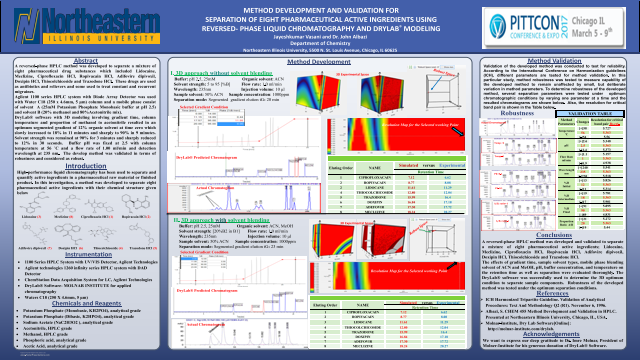 DryLab® software with 3D modeling involving gradient time, column temperature and proportion of methanol to acetonitrile resulted in an optimum segmented gradient of 12% organic solvent at time zero which slowly increased to 18% in 11 minutes and sharply to 90% in 9 minutes. Solvent strength was remained at 90% for 3 minutes and sharply reduced to 12% in 30 seconds. Buffer pH was fixed at 2.5 with column temperature at 56 ˚C and a flow rate of 1.00 ml/min and detection wavelength at 235 nm. The develop method was validated in terms of robustness and considered as robust. Summary: METHOD DEVELOPMENT AND VALIDATION FOR SEPARATION OF EIGHT PHARMACEUTICAL RAW MATERIALS USING REVERSED- PHASE LIQUID CHROMATOGRAPHY AND DRYLAB® SIMULATIONReferences: 	ICH Harmonized Tripartite Guideline. Validation of Analytical Procedures: Text And Methodology Q2 (R1). November 6, 1996. 	Albazi, S. CHEM 455 Method Development and Validation in HPLC. Presented at Northeastern Illinois University, Chicago, IL, USA. 	Molnar-Institute, Dry Lab Software[Online]: http://molnar-institute.com/drylab.